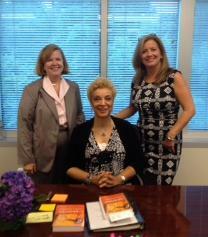 QRCA DC Chapter hosts, “A RIVA day with Naomi Henderson, Secrets of a Master,” with record attendance. The Washington DC chapter hosted a masterful one-day seminar by one of our iconic leaders on June 22, 2012. Naomi Henderson, founder of the RIVA Training Institute, graced her home chapter and an extensive group of visitors with her powerful workshop followed by a book signing. Registrations filled quickly and included many who attended remotely, through FocusVision. Attendees represented a wide range of experience from two college interns all the way to seasoned moderators with over 20 years in the business. Naomi captivated everyone continually as she demonstrating her points, kept us hilariously engaged, and also masterfully tailored her presentation for the benefit of both novices and experienced moderators, alike. As a master trainer, she ensured that we all received ample hand-outs that perfectly reflected the seminar content – freeing us to focus on her presentation. And, as she has done so extensively in her recent book, “Secrets of a Master Moderator,” Naomi always provides case examples from her personal experiences to demonstrate the tips and content she is presenting. She went deeper to address master qualities such as being authentically ‘at home’ with oneself, taking nothing personally, and the integrity of being impeccable with one’s word. Naomi, we thank you for this special opportunity to learn from a master. And we thank you, Observation Baltimore, for so graciously hosting this event, including the delectable catering, in your spacious, environmentally green LEED, facility in Baltimore, MD! This entry was posted on Tuesday, July 10th, 2012 at 5:59 pm. Both comments and pings are currently closed.